One thing's for sure -- your family's certainly not getting smaller… it's just growing bigger! Whether you're having more kids (and even grandkids) or close relatives and grandparents staying with you, this surely means that you need bigger spaces for your home. While a cute, rounded dining table looks intimate and stylish, this may not be suitable for your growing family. Invest in a long and wide table that's perfect for family dinners and morning brunches. 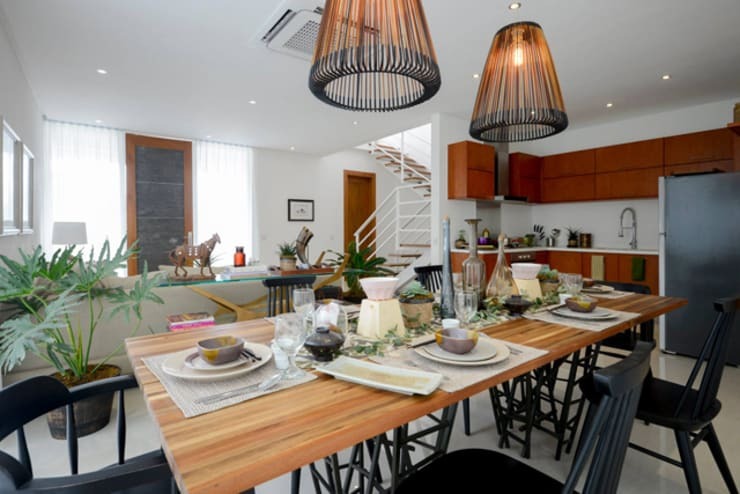 Check out this ideabook and find your preferred dining table! Now if you don't have that much dwellers in the house, here's the right article for you. Check out these 6 amazing ideas for small kitchen and dining spaces! 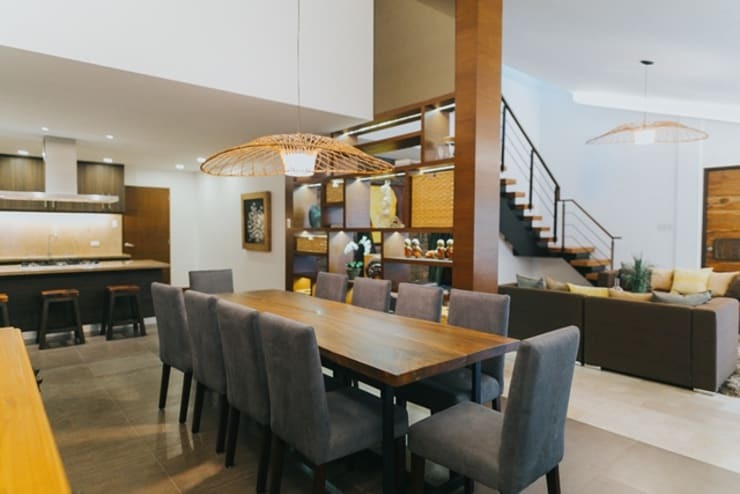 Featured above, this dining room design showcases its rich and warm hardwood table made of fine Mahogany. The table is finished in shellac for that natural and raw glow. It's an ideal dining table for big families that's up to ten people! Moroever, this design also oozes in modern style from the perfect blend of wooden details and contemporary seating choices. 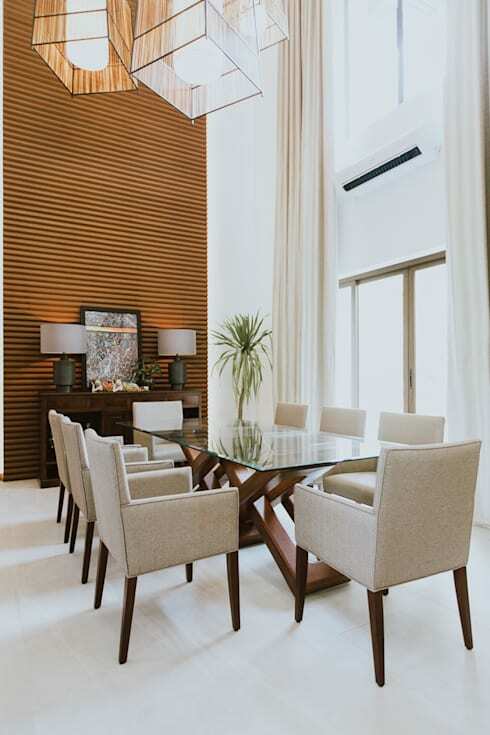 Still very modern, this dining room design offers a richer tone for its table. The table is coated in an absolutely dark and bold shade of brown that acts as a center of attention in the dining room. The dining chairs are very similar to the first example, offering us comfortable and modish seating cushions. This is perfect for a family of six to eight that loves to spend intimate dinners together! Plus, the other elements of the dining room just magically create this overall classy and comfy aura to the room. Wooden tables, featured in the first two photos, are amazing dining options for any Filipino family. We just have this genuine adoration for wood that simply puts other materials to rest. But if you want to explore other options and go for the sleeker style, then glass is definitely first on the list. Glass has this sophisticated element that produces an elegant ambience to any room. This design showcases its crisp and edgy dining table made of glass and wood. The sturdy armchairs also balance the sharpness of the table. Wood..check, glass..check. What other materials can look great for your long family dinner table? -- steel poles! Dining tables built with steel as their foundation are perfect for an industrial style dining room. Take inspiration from this design above -- the polished wooden table rests on a sleek and innovative set of steel bars that are junked up together to create an industrial feel to the room. 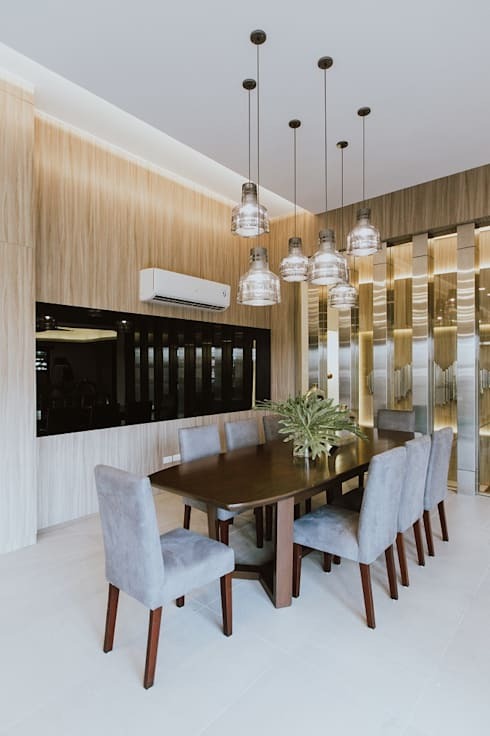 Living Innovations Design Unlimited, Inc has captured our hearts again with their sleek, classy, and sophisticated interior designing. This dining room design just simply wows us. 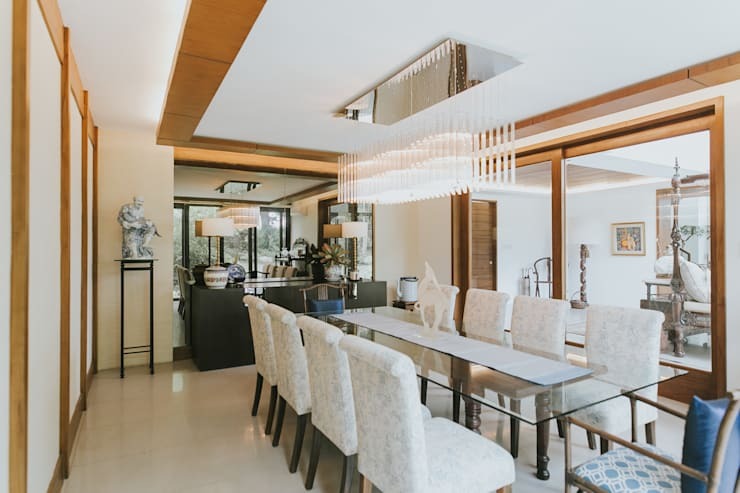 We couldn't help but notice the elegant dining chairs, luxurious chandelier, and of course, its posh dining table. Offering us another glass feature, this dining set exudes in class that's not hard to reach! Recreate this stunning design and your big family will surely love spending dinners together!